Of New York. He was a son of the Hon. John Robinson of Virginia, who was the President of that colony on the retirement of Governor Gooch. When the Revolutionary controversy commenced, Beverley Robinson was living upon that portion of the Phillips estate which had been given to his wife, and there he desired to remain in the quiet enjoyment of country life, and in the management of his large domain. That such was his inclination is fully confirmed by circumstances and his descendants. He was opposed to the measures of the Ministry, gave up the use of imported merchandise, and clothed himself and his family in fabrics of domestic manufacture. But he was also opposed to the separation of the colonies from the mother country. Still, he wished to take no part in the conflict of arms. The importunity of friends overruled his own judgement, and he entered the military service of the Crown. His standing entitled him to high rank. Of the Loyal American Regiment, raised principally in New York by himself, he was accordingly commissioned the Colonel. He also commanded the corps called the Guides and Pioneers. 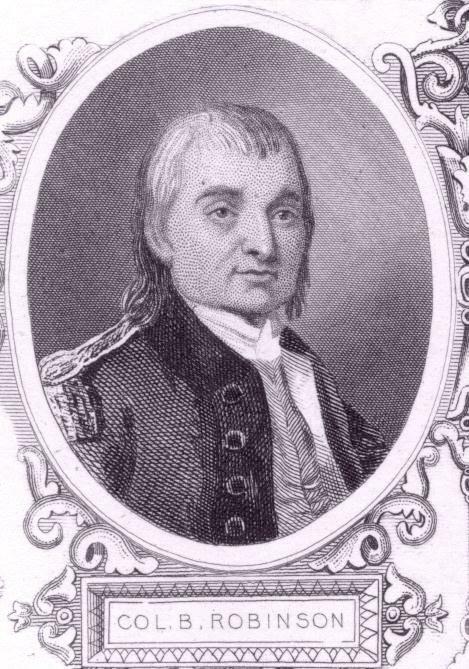 Of the Loyal American Regiment, his son, Beverley, was Lieutenant-Colonel, and Thomas Barclay was Major. Besides his active duty in the field, Colonel Robinson was employed to conduct several matters of consequence; and he figures conspicuously in cases of defection from the Whig cause. In the real or supposed plan of the Whig leaders of Vermont to return to their allegiance, or to form some other and hardly less objectionable alliance with officers of the Crown, he was consulted, and opened a correspondence. In the treason of Arnold, his name and acts occur continually; and it is supposed that he was acquainted with the traitor's purpose before it was known to Sir Henry Clinton, or any other person. And it appears certain that Arnold addressed him a letter on the subject of going over to the Royal side, before soliciting the command of West Point. As the plot matured, he accompanied Andre to Dobb's Ferry to meet Arnold, according to a previous arrangement; but an accident prevented an interview, and both returned to New York. Subsequently, he went up the Hudson in the Vulture, for the purpose of furthering the objects in view; but failed in his most material designs. Arnold now sent Smith on board of the Vulture with a letter, which was delivered to Colonel Robinson, and on the faith of which Andre went on shore. The treacherous Whig had been expected on of the ship in person, and it has been said that Robinson was much opposed to Andre's trusting himself to the honor "of a man who was seeking to betray his country." But the zealous young officer would not listen to the prudent counsel, and determined to embark upon the duty from which he never returned. 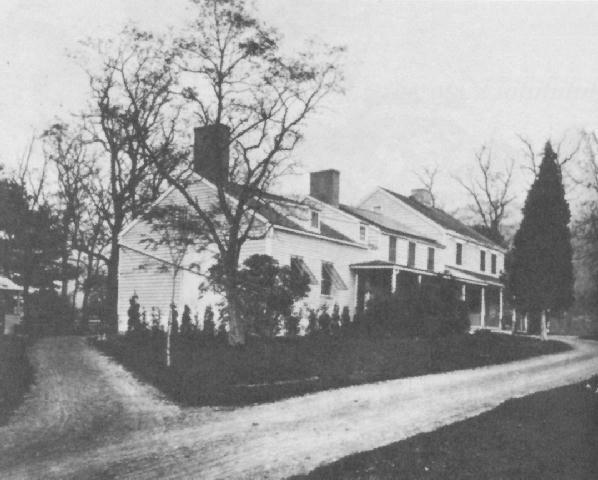 That unforunate gentleman was captured on the 23rd of September, 1780 and on the 26th was conveyed a prisoner to Colonel Robinson's own house, which, with the lands adjacent, had been confiscated by the state, which Arnold had occupied as his head-quarters, and of which Washington was then a temporary occupant. 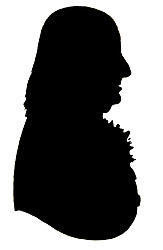 After Andre's trial and conviction, Sir Henry Clinton sent three commissioners to the Whig camp, in the hope of producing a change in the determination of Washington, and of showing Andre's innocence; to this mission Robinson was attached in the character of a witness. He had previously addressed the Commander-in-Chief on the subject of Andre's release; and, as he and Washington had been personal friends until political events had produced a separation, he took occasion to speak of their former acquaintance in his letter. Colonel Robinson, at the peace, with a part of his family, went to England. His name appears as a member of the first Council of New Brunswick, but he never took his seat at the Board. His wife is included in the Confiscation Act of New York, and the whole estate derived from her father passed from the family. [In addition to the personal estate of about £16,000 Sterling, their 60,000 acres and some city property was valued at about £64,000, in all an exceptionally large fortune; after the war, the British Compensation Commission granted them £24,000, though they received only about £17,000.2] After going to England, Colonel Robinson lived in retirement. He was unhappy; and did not conceal the sufferings which preyed upon his spirits. He resided at Thornbury, near Bath, and there closed his days, in 1792 [Robinson died on April 9], aged seventy. Susanna, his wife, died at the same place, in 1822, at the age of ninety-four. Colonel Beverley Robinson was appointed to the command of a regiment composed chiefly of his own tenants, at the head of which he distinguished himself upon several occasions, and particularly at the storming of Fort Montgomery on October 6, 1777, the command of that attack having devolved upon him after Lieutenant-Colonel Campbell was killed. His zealous and very active services rendered him very obnoxious to the enemy, insomuch that of all other men he is perhaps the least likely now to receive any favour at their hands. I am of the opinion that he rendered the most essential services to the Government. It is impossible to speak too highly of him. The many civilities which I have received from Mrs. Robinson and her family make me extremely interested in whatever concerns them; and I must say that my joy, on the return of peace, is greatly damped by the unhappy situation in which many friends of the Government are left. I feel most sensibly for what you must have suffered by the war, and whenever I think seriously upon the situation of this country, I cannot but bewail my folly in the part which I have acted. There was a time when I firmly believed that a separation from the mother country would be the greatest blessing to this. But alas! experience--too late experience--has convinced me, as well as thousands of others, how very erroneous this opinion was. I now see anarchy and confusion every day gaining ground among us. I see the encroachments of our great and good ally with pain and regret. Whether I shall ever live to see the accomplishment of my wish, or not, I can't tell, but it certainly is the greatest wish of my heart to leave my posterity in the enjoyment of that mild government which this unhappy war has deprived them of. 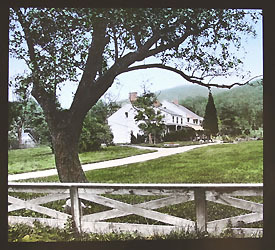 To the left is one of the few known photos of the Robinson House before it burned down in 1892. 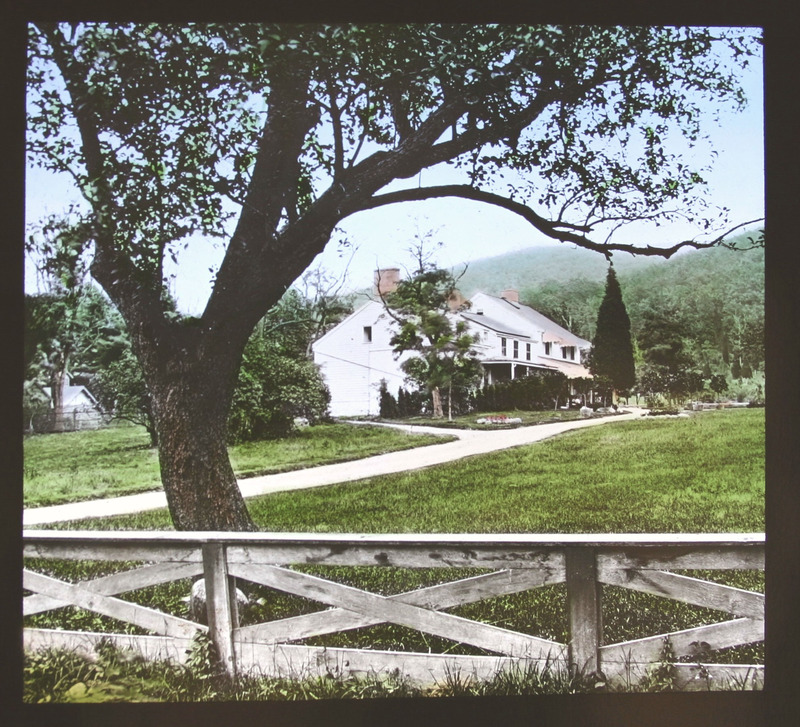 Here's another very rare view of Robinson's house from an 1876 hand-coloured magic lantern slide. Clicking and viewing the larger image reveals a pretty good view of the house. Colonel Robinson's descendants in New Brunswick posess some relics of the olden time, not destitute of interest. Among them is a silver tea-urn, of rich and massive workmanship, and of considerable value, which was the present of an English gentleman, who was the Colonel's guest in New York before the Revolution. This urn, according to the family account, was the first article of the kind in use in America. Prince William Henry, who was afterwards King William the Fourth, also enjoyed Colonel Robinson's hospitality in New York before the conflict, and the circumstance may have contributed something to the advancement of the family.